On this day 26 years ago, inside a packed Trump Plaza in Atlantic City, New Jersey, two bitter middleweight rivals went to war over 12 absolutely thrilling rounds. Outside, snow covered the ground thanks to a blizzard, yet inside the arena the heat was scorching. 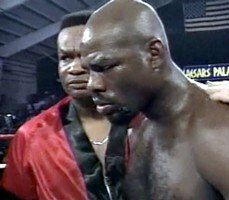 WBC middleweight ruler Iran Barkley fought a thought to be faded legend in Roberto Duran and the fans in attendance witnessed both a modern day classic and a renaissance. For all 12 ‘don’t-blink’ rounds, the 28-year-old and the 37-year-old went to war, with a number of unforgettable highlights and a ton of terrific action on display through the 36-minutes. In the end, old “Hands of Stone” prevailed via a somewhat controversial upset split decision, relieving “The Blade” of his green belt. To this day, however, Barkley – who can be both a touch bitter and unrealistic, such is the fighter’s pride that refuses to leave him – believes he won and was robbed, the victim of boxing politics. This does not dampen what was a special fight and a magnificent night though, and today Barkley does give Duran the respect the Panamanian deserves. James Slater: Your classic fight with Duran took place just over a quarter of a century ago this month. Does it seem that long ago to you? Q: Have you watched that fight recently, on tape or on T.V? Q: Duran shocked the odds and the experts that night. Did he surprise you at all? Q: Were you not surprised when Duran took your best punches, like that double left hook to the head in the 7th-round? Q: As you know, one judge gave you the fight by a 116-113 margin, while Duran won by a score of 116-112 and a very wide 118-112. What did you think to that wide score? Q: Did you try and get a rematch with Duran? Q: Had you actually gotten one though, what would you have done differently against Duran? Q: If you had been given the decision on February 24th, as some people felt you deserved, who do you think you might have fought next – even if you feel Leonard would not have agreed to fight you? Q: Hagler was retired by then but a fight between you and he could have been a brutal fight, how would you have done? Q: Well, you shocked Thomas Hearns so who knows! Was Duran the greatest fighter you ever fought? Q: How hurt were you in the 11th-round when Duran scored that knockdown over you? Q: What is your opinion of Duran today? Q: But there was bad blood going into the fight all those years ago? Q: Did you feel Duran fought a dirty fight against Davey? Q: How would you rate your great fight with Duran? Some people call it the best middleweight title fight of the 1980s.